InteRNA is a Dutch biotechnology company specializing in the development of RNA therapeutics for the treatment of cancer. 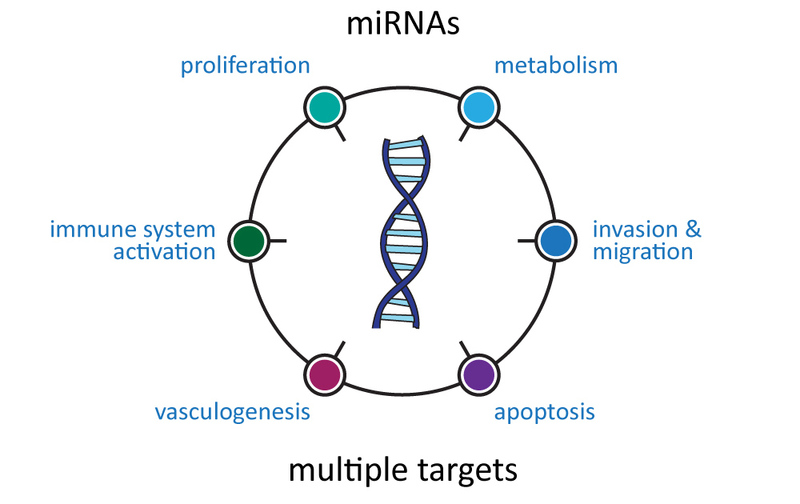 Using its leading microRNA (miRNA) discovery and functional validation platform, InteRNA is developing a pipeline of proprietary preclinical miRNA drug candidates targeting key processes in cancer initiation and progression. Enabled with a 3rd generation drug delivery formulation, these miRNA compounds can mount a coordinated anti-cancer attack by engaging multiple signal transduction targets simultaneously. With this approach, we address the high need for novel therapeutics with improved efficacy and less drug resistance that really benefit cancer patients. leading to improved long term control of advanced tumors and reduced relapse rates. Cancer is a disease caused by multiple defects in a cell. Drugs blocking several tumorigenic signaling pathways at the same time may result in novel and better treatment strategies with higher efficacy and less drug resistance than drugs targeting a single target. miRNAs can inhibit multiple mRNA targets in a coordinated fashion thereby regulating their protein expression. By optimally using this characteristic of miRNAs, i.e. blocking activated cancer signaling pathways and preventing activation of alternative cancer signaling pathways, InteRNA designs breakthrough therapies tackling cancer. InteRNA pursued a new approach to identify the best miRNA candidate/miRNA targets for each disease type considered. The developed miRNA discovery and functional validation platform enabled an unbiased screening approach in R&D focusing on the elucidation of the functional roles of individual miRNAs. This approach gave a direct insight in potential function and allowed for combinatorial screens with e.g. chemo, radiation, targeted kinase inhibitors and immunotherapy to address resistance/ resensitization. InteRNA is building a diversified product pipeline with a focus on lead drug candidate INT-1B3. INT-1B3 is a LNP-formulated, chemically modified miRNA mimic inducing apoptosis through caspase activation and PARP cleavage. In addition, INT-1B3 regulates the adenosine-A2A receptor pathway (through regulation of ATP->adenosine converting enzymes CD39 and CD73), inhibiting the escape from immune surveillance, and in parallel makes immune ‘cold’ tumors ‘hot’ through recruitment of CD8+ Teff cells and downregulation of LAG-3/FoxP3 Treg cells. Its MoA further encompasses regulation of CyclinD1, Mcl-1, K-Ras, c-Kit and TIM-3.